Are your Leaders Leading or Doing? Time and time again, companies promote the highest performing individual contributors within their companies to leadership positions. These people have grown in their careers based on their technical expertise in their role and leaders feel that makes them qualified to lead a team of people, but does it? We see this trend span across all roles and industries. While the ability to understand the role and drive business results is important, it’s also critical for the leader to have a desire to lead people and let go of the “doing.” For leaders, sometimes the tendency to do the work is easier than coaching their people to do it differently or better. Making this mental shift from doing versus leading is challenging, as being a leader requires us to develop or hone different skills. While sports analogies can be over-used, it’s truly helpful to think of a coach of a sports team. The best coaches watch their players and can coach them on performance, as opposed to playing in the game. The best coaches also understand how to adjust their approach, if warranted, to fit the talent they may have on the field as it oftentimes changes from year to year. Not unlike keeping and maintaining (star) employees. We once had a client whose senior leader defined leadership as redoing his employees’ work and giving them credit. This was quite daunting and as a result slept only about four hours a night. His employees feel like he had no trust in their abilities and many quit over time. This also wasn’t a scalable model because he was trying to be involved in every project. If he had invested his time in observing and coaching his people around their performance, he would have empowered them to do the work and become more effective in his role as a leader by having a high performing, capable team. How can we change the way we think about promoting and transitioning people into leadership positions? 1. Look at the whole person, not only what they have accomplished in their individual work. Look for people who have a desire to lead people and who are willing to make the shift. 2. Include coaching as a leadership competency. 3. Teach your leaders what coaching looks like. 4. Reward your leaders on their employee growth and retention in addition to their team’s business results. 5. Implement a leadership mentoring program, which can be a key toward honing and keeping star employees who you think have that “leadership something special”. When the right match happens, it can be the catalyst for transformation—then watch that star rise and lead! Must Job Seekers Give Employers a Reason to Reject Them? Imagine you're a store owner who's interviewing three finalists for a sales job. All are equally qualified-but two need a little flexibility. Daniel is Jewish; he doesn't work on Friday nights or Saturdays. Lisa is a Christian who doesn't work on Sundays. The third candidate, Kim, can work any day. At your store everyone gets weekend duty twice a month. A while ago you bent the rules for a Sabbath observer: It was no hardship, but it caused muttering. You'd prefer not to do it again. During interviews neither Daniel nor Lisa mentions religion; you never ask. But Daniel talks about growing up in Israel, just as your last Sabbath observer did. A potential problem, you conclude, and cross him off your list. You offer the job to Lisa, unaware she has a similar conflict. Have you discriminated illegally against Daniel? Probably so: The law requires you to discuss reasonable accommodations for religious practices. But let's be frank: Unless you reveal your private thoughts, you'll likely get away with it. Hiring bias thrives on such silent brush-offs. Job seekers in wheelchairs know the shabby routine. So do job seekers of color, job seekers with foreign accents, older job seekers, and others. Every day these applicants must swallow unjust rejection, knowing they can't call anyone to account. Every once in a while, however, an employer tips its hand. Back in 2011, for instance, a federal court found that Abercrombie & Fitch, the clothing retailer, discriminated when it rejected a Muslim job seeker who interviewed in a headscarf, or hijab. On February 25 the U.S. Supreme Court will hear arguments on whether to let Abercrombie off the hook. The case focuses on religious bias, but it may also affect disabled workers and some pregnant women. In effect, the Court could deny protection to applicants who don't warn employers explicitly that they'll need flexibility-even if the employers end up rejecting them on exactly that basis. Some background: At über-preppy Abercrombie, black clothing is verboten for salespeople, as is some headwear. Nonetheless, in 2008 Heather Cooke, an Abercrombie hiring manager in Tulsa, Okla., decided she wanted to hire then-17-year-old Samantha Elauf, who had worn a black headscarf to her interview. Cooke correctly assumed that Elauf wore the scarf for religious reasons, but she never raised the issue and figured that Abercrombie could adapt its rules. When Cooke checked with a higher-up, however, she was ordered to ding Elauf for the hijab. The lower rating made Elauf unhirable, and Cooke never called the teenager back. For most job seekers, the story would end there-another silent rejection. But a friend at Abercrombie tipped Elauf, who contacted the U.S. Equal Employment Opportunity Commission. The EEOC sued Abercrombie on her behalf, claiming that the retailer knew it should try to accommodate the hijab-yet failed to discuss it. The judge agreed, and a jury awarded Elauf $20,000. Abercrombie appealed, saying it couldn't be liable for failing to do something that Elauf never requested-and anyhow, that it didn't know for sure about the scarf. A federal appeals court bought that logic, setting up next week's showdown. How would our imaginary job seekers fare if Abercrombie wins again? First Daniel, who studied in Israel and never knew of your Sabbath issue. Out of luck, says Abercrombie: He didn't specify his need, so you don't have to accommodate it. But suppose, in a fit of honesty, you tell Daniel why you rejected him. Now can he hold you accountable? Still no, says Abercrombie: Liability kicks in only after an explicit request. How about Lisa, who doesn't work Sundays? Let's say she spoke up during your interview, trying to protect her rights. Would you still have hired her? Or would you maybe have "realized" that flexible Kim is a better candidate-for totally non-discriminatory reasons, of course-and issued another silent rejection? Employees live in the real world; so must our laws. Hiring bias is common, and already tough to prove. The Supreme Court shouldn't make things worse by making job seekers' legal rights depend on their mind-reading ability-or on their willingness to risk a job offer. If an employer shows bias, it should answer to a jury. He is a past president of the Metropolitan Washington Employment Lawyers Association. Self-awareness is crucial in the workplace. Knowing your own strengths and limitations, and how others see you and your behavior, has been linked to a range of positive outcomes. But when it comes to understanding how others see us, many of us are in the dark. When you compare how people categorize themselves with how their counterparts categorize them, the correspondence is disturbingly low—not much better than flipping a coin. Not realizing how others see you leads to bad decisions and spoiled relationships. And when others sense that you’re clueless about your personality, it can undermine your general stature and credibility. If self-awareness is so important, why do so many people lack it? One reason is because other people often don’t serve up clear signals. Some of this reflects politeness and white lies (“Your presentation looks great!”). Other skewed signals stem from tactical motives, like ingratiation (“Of course you’re the best manager in the division, boss”). This warped and ambiguous feedback then runs up against two of our own internal tendencies: We often make self-flattering assumptions, and we expect others will agree with us: “I think I’m a good, effective, talented person…and so others must see me that way, too.” Repeat something like that enough times and it can become a force field, deflecting the occasional true signal that does head your way. One effective way to raise self-awareness is to gather anonymous assessments from peers and colleagues, with the results collected into an overall report that doesn’t identify who said what. Do something—one thing—that can initiate a process that might lead to greater self-awareness. If you’re on your own, you might enlist the help of an executive coach who can facilitate not only gathering data but also making sense of the results. Contact an executive coach. Talk to a role model about their self-awareness and how it has mattered to them. Reach out to a trusted confidant and to tell you how others see you. Definition: The term 'consultative selling' first appeared in the 1970s book Consultative Selling by Mack Hanan. It describes a selling technique in which the salesperson acts as an expert consultant for his prospect, asking questions to determine the prospect's needs and then using that information to select the best product or service for those needs... ideally, the salesperson's own. Taking the consultative selling approach, you must first examine your sales territory by reviewing customers, analyzing target accounts, determining how much an account is worth and learning how to prepare sales objectives. The sales objective method is based upon strategic sales planning and professional selling tactics. This includes territorial examinations, customer reviews, account analysis, worth/value of time, writing sales objectives, translating account needs and objectives into a plan of action. A Major Account Plan would include data on the target company along with specific major sales objectives, the date to accomplish the objective, the person affecting the buying decision, the anticipated obstacles and the plan sub-objective steps with dates that are necessary to achieve the major objective. For implementing the strategy it makes sense to understand the personality and objectives of the person affecting the buying decision before beginning the sales process. When 'desire' surfaces, the prospective buyer takes the lead in the conversation while you provide the evidence necessary to justify the transaction. Prior to the Sales Call, the salesperson needs to plan for the sales interaction. She or he must write down the "sales call objective" and their conversational strategy (what they plan to ask, show and tell the prospect). Also, it is important to list the anticipated obstacles that might come up and what the salesperson's response will be to each obstacle. Writing these preparations down on a 3X5 or 4X6 card will help the sales person remember to review the plan prior to the start of the sales conversation. Understand your own personality and that of the prospective buyer; as well as the personalities of others who may be influential in the decision-making process. Learn how to adapt to different buying styles and secure a commitment. Sales by Objectives training method by Signature, Inc.
Editor's note: This article was adapted, with permission, from the February issue of The Elliott Wave Financial Forecast, a publication of Elliott Wave International, the world's largest market forecasting firm. All data is as of Jan. 30, 2015. Click here to read the complete version of the article, including specific near-term forecasts, 100% free. A significant hint of economic softening is the slight decline in average hourly earnings in December. It came despite "a healthy 252,000 increase in jobs. Economists are struggling to explain the phenomenon," says the Associated Press. "I can't find a plausible empirical or theoretical explanation for why hourly wages would drop when for nine months we've been adding jobs at a robust pace," says a perplexed economist. 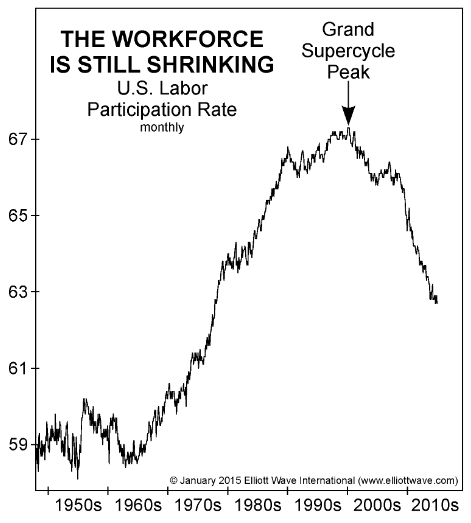 The chart above of the U.S. Labor Force Participation Rate presents a similar conundrum. Why is it falling when job growth is rising? The answer, we think, is the emerging force of deflation. Notice that the peak participation rate of 67.3% came from January to March 2000, as the major stock indexes topped, after which inflation first began to falter. When stocks rallied to their 2007 top, there was a mild bounce in the rate, but the latest stock market rally failed to generate any sustained rise in the rate of work force participation. Workers appear so discouraged that the pool of available employees is back to where it was in 1978. The opening chapter of Robert Prechter's best-seller, Conquer the Crash, illustrates various other measures depicting a long-term economic deterioration and states, "The persistent deceleration in the U.S. economy is vitally important, because it portends a major reversal from economic expansion to economic contraction." As "great" as it was, the Great Recession of 2008-2009 was just a prelude. Click here to continue reading the complete version of the article as part of a lengthy excerpt from the newest issue -- including specific market forecasts, fully labeled charts and more -- 100% free. This article was syndicated by Elliott Wave International and was originally published under the headline Why the Workforce Still Shrinks as Job Growth Rises. EWI is the world's largest market forecasting firm. Its staff of full-time analysts led by Chartered Market Technician Robert Prechter provides 24-hour-a-day market analysis to institutional and private investors around the world. There is nothing wrong with a life filled with good, steady work. However, challenges often arise when making a living takes priority over creating a loving, meaningful life. In "Ignite CALM: Achieving Bliss in Your Work," Dr. Debra Snyder brings forth holistic techniques and lessons to help readers transform their professional lives for the better. The book teaches how to bring your best self to work each and every day and discover true happiness while on the job. By accessing that sacred place within yourself, you have looked at your life through a high vibration filter and can now make positive, conscious choices in support of your spirit. Where we work, what we do, and how we do it---the power is all in our own capable hands. All things we experience are intimately connected; every action we take, every decision we make, brings us further from or closer to the wishes of our souls. When we are in resonance with our souls' purpose and inner calling we do not doubt our thoughts and actions. You welcome happiness by opening your heart and mind to alternative ways of thinking and taking conscious time to process your feelings. You will allow bliss to work in your life. As you continue the journey of working with this CALM approach, give yourself full permission to explore and make mistakes as you manifest a job you love and create the life you truly desire to live. As a young girl in Ghana with only sticks for toys, Mary Spio's father would tell her, "Small hinges swing big doors." The smallest act could start a chain reaction that might eventually impact the world. This minor phrase held a great significance for Spio, who moved to the U.S. on her own at age 16 in order to change her circumstances and build her own path to greatness. Within a decade, despite not having seen a computer until age 17, she was designing and launching satellites into deep space with a NASA project, heading up a satellite communications team for Boeing, and pioneering digital cinema technology for LucasFilms that redefined the distribution method for major motion pictures. In Spio's new book, "IT'S NOT ROCKET SCIENCE: 7 Game-Changing Traits for Achieving Uncommon Success," she offers advice and insights that reveal what successful people do differently. That is perhaps the most important question in life. From a very young age, we start the search for our reason for existence. When we discover the answer to this question, it validates our existence and our lives. Finding the answer brings joy, peace and fulfillment, as well as material success. Until this question is answered, we often feel as if a part of us is missing. We are restless, aimless, with a deep longing within our soul. Without a life of meaning and significance, the human experience becomes a breeding ground for hopelessness. Humans have been asking the "why" question for thousands of years. The answer is quite simple: We are here to discover and live our greatness. We are wired for challenge, not monotony. We are meant for something far greater than working in a meaningless job, eating, sleeping and watching TV. The journey to greatness starts with looking inside ourselves. It is that place where you are radically passionate about what you're doing, you are naturally gifted to do that thing, and you are using that passion and those gifts to solve problems and serve others. When you operate in that space, you've found what you're here to do. How can you use pattern recognition to sharpen your focus and alert your business mind to prepare for transformations? First and foremost, you need to identify patterns that are present in certain events and trends that affect your business. Then, adjust your decisions accordingly. Your mind is essentially a window of possibilities. It can be creative and innovative, but sometimes it fogs up and must be cleaned by clearing out old views and replacing them with fresh ones. When preparing to transform a business, look for patterns prior to beginning that could help you determine which actions to take. These patterns may be within your business, or they may occur outside it. Train your brain to scan for possibilities brought on by external changes. Is there a pattern to this activity? What are the media and industry analysts paying attention to? What trends are happening? Then, note the patterns that are occurring inside your business. Perhaps you'll notice a pattern in the demands your customers are making. Go through your customer support feedback. What are customers asking for? Is it something you can support, change or alter? As you can discern from customer complaints, connections may be made one at a time, while unfolding into an overarching pattern. This pattern can be shaped into a realized action plan, thanks to the time, teamwork, open minds, and creativity. As opportunity assessments are conducted and information is uncovered on the path to transformation, business leaders must allow flexibility when the need arises to veer from the path in order to maximize possibilities. Q: Last year, we sold more professional services than expected. Now it looks like our services revenue will be higher than that generated from software product sales by the end of the year. What key success factors should we watch to maintain our company profits? A: Managing professional services tends to be highly predictable with a steady positive cash flow. Whereas, managing a product business can result in very unpredictable swings in monthly revenue generation. The fluctuation in revenue is one reason why product sales generally carry higher profit margins than the steady cash flow generated from service fees. Professional services have become a commodity in most industries and this has resulted in competitive pricing. So, I would suspect that your concern about maintaining gross profits of the past, when product sales dominated your business, is very real now that operations are more services oriented. When the majority of your revenue came from high margin product sales, you could afford to provide lower margin professional services to train new customers and implement product solutions. Now that services are exceeding product sales, your overall gross profit margins are, most likely, dropping. Maintaining a profitable balance between services and product revenue can improve overall company profitability. Proprietary equipment or software sales allow for slightly higher margin service fees when the customer is locked into your product. Conversely, product-educated service providers can steer prospects toward buying your proprietary high margin products. Everyone sells what they know will work best for the customer. Test business strategy by knowing what customers think of you. If you think your business is now and will be more service-driven than product-driven, it is time to rethink your business and pricing strategy. Very large companies in the information technology industry, like IBM, are successfully moving from product-driven to services-driven businesses. Having your product customers outsource their management and maintenance services to your company may prove to be a long-term win-win arrangement. Once you decide on what drives your business, services or products, it is time to check to see how your customers and potential customers see your company. Customers’ buying decisions are based upon their perception of the best value available. Value is comprised of service, quality and price. Note that it’s “perceived value” that counts. Perception is how others view us. You have a great deal of control over that perception; in how you and your employees present your company in person, advertising, correspondence and brochures, and what you deliver in product or services. If you clearly understand your company’s technical and marketing strengths relative your competitors, you can deliver a consistent and powerful message. A key success factor is to periodically test to see how your customers’ perceptions have evolved---to always know what they really think about your firm. Periodically analyze what your customers want to buy from you. When you and your employees are delivering products or services to customers, you receive “grazing rights” within your customer’s place of business. These grazing rights give you the ability to look for new opportunities where your firm can provide something that your competitors can’t readily deliver. Once you have defined what that new service or product might be, informally ask your customer contacts if they would be interested in buying such a product or service from you. If their answer is “yes,” explore what it would take to structure your organization, your operations and your company’s image around these new strengths. Developing and delivering new customer-driven products and services can lead to consistently profitable revenue growth. Is Time Management Your Biggest Challenge? How do the most successful people choose to spend their time? Successful people think differently. And it is their thinking that shapes a different set of choices they make, which ultimately yields incredibly different results from the rest of us. Most of us delay the day's most important activities by consciously or unconsciously allowing our attention to shift to less important tasks. To someone struggling with priority dilution, it can sometimes feel like the harder they work, the more they fall behind. For every email they send out they get two in return. And each task they complete seems to hold behind it two more additionally that need to be done. Their life is often characterized as a constant state of interruption. They are spread thin. Overwhelmed. Under-rested. And they feel like they are falling further and further behind. Too many times we have a focus on all that we did instead of all that resulted from what we did. Success usually is the result of focusing our talents, money, time or energy in one priority direction for a shorter period of time to create a desired result. The beauty of imbalancing your resources in one direction for a short period of time is that once you create your desired result, it is usually much easier to maintain that level of performance. Strong focus on results that really matter is the reason why financially successful people choose to be paid on their results, rather than their time. They choose to take a chance on themselves. They believe in their own self-discipline and their own ability to produce results. Results are what matter, and they are what you keenly drive toward. If you focus on producing results without limiting your ideas about how to create those results, you will come up with amazing solutions. Can the brain heal and preserve itself—or even improve its functioning—as we get older? For some time, many scientists have tended to think of our brains as machines, most commonly as computers, destined to break down over time under the strain of age and use. In recent years, however, research in neuroscience has begun to show the inadequacy of this metaphor for describing the physiology of the brain. It turns out that our brains, like our bodies in general, are far more likely to waste away from underuse than to wear down from overuse. As people reach middle age, exercising the brain and the body to which it is attached—keeping both active—becomes more important. It is one of the few reliable ways to offset the natural wasting process and the damaging influence of our unnaturally sedentary modern lives. It also points to new possibilities for the brain to heal itself in the face of disease and trauma. In the late 1970s, research by Mark Rosenzweig of the University of California at Berkeley and Michael Merzenich of the University of California at San Francisco and others began to show that the brain’s circuitry changes microscopically with experience and activity. Dr. Rosenzweig and colleagues found that, with environmental stimulation, the brains of animals grew in key areas. Dr. Merzenich discovered that if an animal stopped using a body part, the brain area that processed sensory input from that part weakened or was taken over to perform another function. These findings have since been replicated many times. The mainstream view in neuroscience and medicine today is that the living brain is actually “neuroplastic”—meaning that its “circuits” are constantly changing in response to what we actually do out in the world. As we think, perceive, form memories or learn new skills, the connections between brain cells also change and strengthen. Far from being hard-wired, the brain has circuits that very rapidly form, uniform and reform. We still have a lot to learn about the brain and its powers of recovery, of course. But increasingly we have the evidence to conclude that we have been seeing our brains the wrong way for too long. Metaphors often conceal as much as they reveal. One day, we may well marvel at how odd it was that, for several centuries, we chose to view our ever-changing, activity-craving, animate brains as fixed, passive, inanimate machines.